Courtesy of Motherwell FC's new Health and Wellbeing partner Paycare, the Motherwell Times is offering one lucky 'Well fan the chance to win a pair of Davie Cooper Stand tickets for Saturday's exciting Motherwell v St Johnstone Scottish Premiership clash at Fir Park, kick-off 3pm. With just three games until the split, seventh placed Motherwell - five points off the top six - must win to keep the pressure on sixth place Hibs in the race for a top half finish. To enter the competition, just visit the Motherwell Times and Speaker Facebook Page, hit Reply with your answer to the simple question below and (if you haven't already done so),'Like' the page. Also Share if you can. We'll draw the lucky competition winner around 3pm tomorrow (Thursday). The winner should collect his or her prize from the Chapman Building in front of the Phil O'Donnell Stand before kick-off on match day. Good luck! 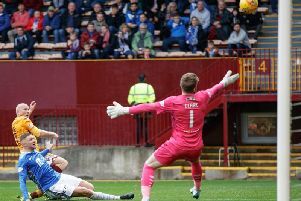 QUESTION: Which Motherwell striker (pictured) netted the winning goal in the Steelmen's 2-1 league win over St Johnstone at McDiarmid Park on December 15?